Located in the esteemed area of north Naples, The Quarry is an upscale active lifestyle community of 900 homes. Built by Pulte Homes, it is surrounded by 830 acres of pristine nature preserves and a 230 acre scenic lake. This community is home to an impressive clubhouse and a private 18-hole championship golf course. Buyers have the option of purchasing a new home or selecting a residence from resale inventory. Home styles include single-family and carriage homes. Residents have use of the beautiful Quarry Lake Lodge & Beach Club that overlooks a sandy beach and Stone Lake. It houses a fitness center and movement studio with men's and women's locker rooms. The clubhouse also has a meeting room, gathering room, billiards, card room, and massage services. The Lake Lodge Grill is a casual restaurant with limited hours for lunch, happy hour and weekend dinners. Residents can dine indoors year round or outside during the warm season on a covered terrace. The restaurant is surrounded by an outdoor resort-style pool and spa, a lap pool, spacious sundecks. The amenities also include a tennis lodge with five lighted soft-surface courts and on-site tennis pro. There are also three bocce ball courts, two pickleball courts, walking and biking trails, and bock docks for rental. Centered around clear lakes of open water and nature preserves, this community provides plenty of on-site opportunities for fishing, boating and water-skiing. The attractive centerpiece of this gated community is the 18-hole, par-72 Hurdzan-Fry golf course. Membership is optional but required to access the Golf Lodge amenities. The Golf Lodge has a pro shop, restaurant and golf practice facilities. This community has a variety of home designs including both attached and detached models. The attached Carriage Homes are two level buildings that offer both a first-floor unit and a second-floor unit. They range offer 1,654 or 2,297 square feet of living space with two or three bedrooms, two or two-and-a-half bathrooms, and a two-car garage. Homebuyers who want a more private option can select from the single-family home designs. These single family homes offer between 1,641 and 4,427 square feet of living space with two to four bedrooms, two to four bathrooms, and an attached two to three-car garage. Residents love these low-maintenance homes for their convenient first-floor living and open floor plans. The Quarry offers a very comfortable resort-like lifestyle with country club amenities. Active adults can choose from tennis, golf or aquatic recreation; they get all these amenities within one community. Homeowners enjoy competitive housing prices and values while also reaping the benefits of the appreciation of nature. In addition to all the club amenities, residents have the option of participating in organized group activities like Zumba, men's and ladies' golf, stitching club, bocce ball, cycling club, Mah Jongg, yoga and tennis. 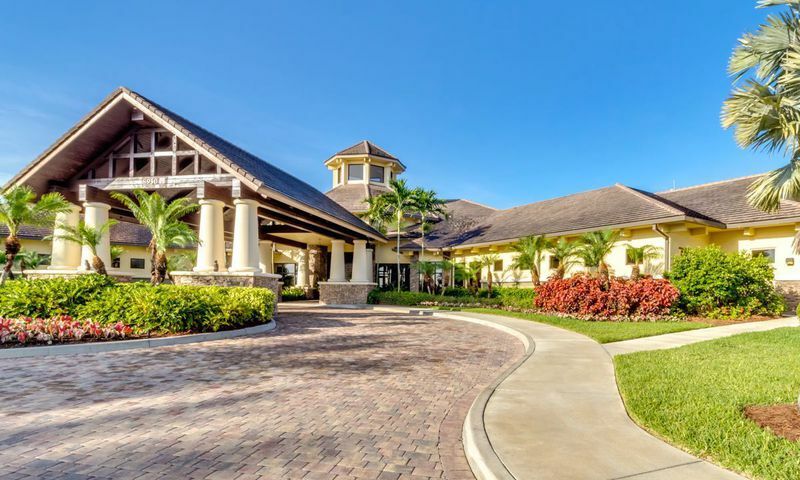 Conveniently situated within four miles of I-75 and 17 miles from the Naples downtown area, This community in Naples is in proximity to many shopping, dining, recreational and cultural opportunities. Naples has a spectacular selection of plazas and shopping centers that include everything from small boutiques to large department stores. Popular shopping destinations include the Waterside Shops and the Coastland Center Mall. Cultural venues in the area include the Naples Playhouse, the Philharmonic Center for the Arts, and the Naples Dinner Theater. Residents also reap the benefits of the renowned NCH Healthcare system, one of the most progressive in the United States. Notable cities near the community include Naples Park, Cape Coral, Fort Myers, Fort Myers Beach, Cypress Lake and Boca Grande. For long distance travel, the Southwest Florida International Airport is within 25 miles from the community. The Quarry in Naples, Florida is a great active lifestyle community for homebuyers seeking elegant homes and a country club environment. There are plenty of activities available in The Quarry. Here is a sample of some of the clubs, activities and classes offered here. Homeowners looking for a great low-maintenance option should look at Carriage Home models. Two models are offered with 1,654 or 2,297 square feet of living space. They have two or three bedrooms, two or two-and-a-half bathrooms, and an attached two-car garage. Residents can choose from eleven single-family home floor plans. These models range from 1,641 to 3,193 square feet of living space with two to four bedrooms, two to four bathrooms, and an attached two to three-car garage. Homeowners love these models for their convenient single-floor living and open layouts. Single-family homes in the Royal Series offer 3,504 to 4,427 square feet of living space. They have three or four bedrooms, three-and-a-half to four-and-a-half bathrooms, and an attached two or three-car garage. These models are some of the larger homes offered in the community and have plenty of space for friends and family visiting from out of town. The Quarry is our seasonal home for 8 months returning to Cape Cod Massachusetts for summer. We are 68 and enjoy the active lifestyle, amenities and location. Making friends is easy with over 15 monthly social events planned by a full time professional along with daily exercise, yoga, dance and arobics classes. The golf course , tennis courts, pickle ball courts and Bocce courts are well maintained. The wildlife and natural wildlife is breathtaking. Several restaurants make eating out a breeze whether at the pools or indoor/ outdoor venues. We think The Quarry is a Club Med for Seniors! The Quarry is a great place to live. All ages community with a good mix of families and retirees. Wide range of prices available. Boating options on the lake is a plus! Clubhouse has multiple pools, a few bars and restaurants and there's a beach! Recommend! The Quarry is really fantastic. My wife and I moved here in 2010 and have been very impressed with the community. The homes are constructed with quality materials, the clubhouse and grounds are perfectly maintained and the Naples location can't be beat. It's really like being on vacation here with the golf and the lakes, the restaurant is outstanding, the fitness center and pools are great. Everything here is really top-notch! 55places.com is not affiliated with the developer(s) or homeowners association of The Quarry. The information you submit is distributed to a 55places.com Partner Agent, who is a licensed real estate agent. The information regarding The Quarry has not been verified or approved by the developer or homeowners association. Please verify all information prior to purchasing. 55places.com is not responsible for any errors regarding the information displayed on this website.